Amazon is getting a bit more bold with every passing day, it seems, as they step ever-further into Netflix’s domain. 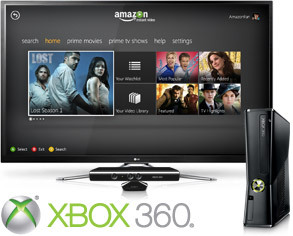 The most recent such intrusion is their creation of an app for the XBox 360 that allows Amazon Prime subscribers to access the Amazon Prime Instant Video selection and stream directly to their television. Naturally there is also access for those who prefer to rent or buy in addition to or instead of working with the subscription plan. It is hard to say whether this works out well for the Kindle Fire. The major appeal of the Kindle Fire, for a fairly large portion of the customer group, is its ability to stream video from Amazon with no trouble at a moment’s notice. Lacking as it does any form of cellular connectivity, the Fire is basically something you are going to be watching video on at home if video is being watched. It is hard to picture large numbers of people gathering at public WiFi hotspots to watch their favorite films on portable devices. When Amazon makes a move like this that offers a potentially superior in-home viewing experience, we have to wonder what the overall effect will be. The major flaw in turning the Kindle Fire into a video streaming device has always been its lack of video output. Naturally this is not an issue when we’re talking about the XBox. These game systems are already in several times the number of homes as the Kindle Fire, especially when you factor in the Playstation 3 which got its own Instant Video app back in April. There is always the chance that Amazon’s expanding media availability will render their hardware somewhat obsolete. There are some downsides to this new offering that will probably keep it from becoming a prime means of consumption for the majority of users any time soon, however. For one, users are required to maintain an XBox Gold subscription. This is a relatively minor expense, but it does in many cases increase the monthly cost of access to Amazon Prime Instant Video in a significant way if users do not already maintain this subscription for other reasons. There is also no integrated purchasing mechanism. One of the biggest advantages, and sometimes dangers, of using a Kindle Fire is its quick and easy store integration. If you want to pick up a copy of the latest big name action flick, you can do it and be watching within seconds. The XBox app will require users to head to a PC for all of their purchasing before anything goes up on the TV. If you have a chance, I do recommend giving this one a try. The interface is reminiscent of the new Netflix application for the XBox and while I can’t say the video selection is as simple to navigate, I have definitely found some surprising and enjoyable titles floating around in the past few days. I love my Kindle Fire, but the jump from a 7” screen to a 47” screen makes an amazing difference when you’re watching just about anything.